The Apple effect is in full swing, with UK retail giant John Lewis revealing that sales of wireless headphones are up 60% week on week, as news circulated about the lack of a headphone jack socket on the new iPhone 7. John Lewis is one of the biggest electronics retailers in the UK, and a great weathervane for people's buying trends. Although the iPhone 7 announcement only came on September 7, the lack of a headphone socket had been mooted for a considerable time and become more and more obvious in the past week. Apple, describing its own decision as 'courageous', has dumped the port entirely and gone with their own proprietary lightning port for headphones - relying on a supplied adaptor or wireless technology. This is a controversial move, but Apple does not go back on decisions and the public are savvy enough to realise the writing's on the wall for their old 3.5mm jack cans. "Last night's announcement will drive the biggest sales in wireless headphones yet", said Katrina Mills, Buyer Audio and Smart Home, at John Lewis. 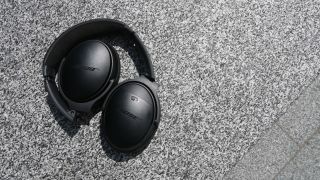 "Ahead of the news we had already seen an increased demand for wireless headphones, with noise cancelling functionality and sport models proving popular." Apparently it's Bose that has seen the biggest growth with John Lewis on the headphones front with sales a whopping 260% up on the same period last year. The Bose QuietComfort 35 headphones are the big seller - but how do they stack up?